It’s counter-intuitive to most business practices to bring your customer in at the highest levels of the company to improve the company. However the members of the Chief Customer Officer Council are familiar with not only how to do this, but the many benefits of creating a seat for the customer right next to the other c-suite executives. Curtis Bingham, Founder and Executive Director of the Chief Customer Officer Council knows this well. He’s this week’s guest on The Modern Customer Podcast. 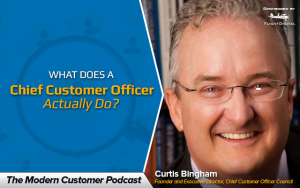 In this podcast, Bingham talks about how the Chief Customer Officer Council presents a collective crystal ball that tells where the customer is going and how can we chart a path to meet the customer there. Today customer experience is a known differentiator but it wasn’t always that way. If we think about differentiators over time, it used to be who had the fastest cheapest product, then it was logistics such as who could deliver the product or service the fastest and most cost-effective, then customer service became a known differentiator–though some companies still don’t understand this concept. Now it’s about moving beyond the experience to see who is willing to engage customers and co-design and co-develop products with them? The Chief Customer Officer drives customer strategy at the highest levels of the company. The Chief Customer Officer is uniquely accountable for customers, like the CEO is uniquely accountable for shareholder value and the CFO is responsible for performance in financial markets. There’s a handful of objectives shared by all chief customer officers. One objective is to drive profitable customer behavior. How do we acquire the most valuable customers? How do we drive customer engagement and loyalty? How do we create a customer-centric culture? The responsibilities of the chief customer officer vary by job-type. Some chief customer officers have line authority which is officially sanctioned authority to issue orders to subordinates (small and mid-size companies this is popular), large companies focus more on retention. At the larger companies they might own the call center or professional services if they have line authority, or in some cases, they’re a staff function. They’re there to improve processes across all the business units. There are common accountabilities of chief customer officers such as how they’re involved in customer issue escalation and resolutions. For the first year, the chief customer officer is in the role they’re dealing with customer issues. They’re focused on gaps between desired customer experiences and actual customer experiences. The chief customer officer is focused on metrics and analyses. The chief customer officer, unfortunately, spends a lot of time proving their value which is a shame because they’re not able to do as much for the customer. They’re busy playing politics. During the recession, the chief customer officer was the first high-level officer to get cut–unfortunately for these companies. The chief customer officer is also focused on deriving value from every customer segment, and determining what type of relationship you want to have with your key customers, and what do they want from you. They spend a lot of time addressing customer needs, and balancing those customer needs with the requirements of the business. The average tenure of the chief customer officer is thirty months. However, it can take three or even five years to clearly demonstrate the value of the company. Short-termism hurts customers and the business. Wall Street loves it, but it’s hard to change customer attitudes in one quarter. It’s important to define customer engagement. Curtis Bingham says if you talk to marketing agencies, they define customer engagement as when you interrupt the customer’s flow with a pop up on the customer’s screen—the agency puts something in the way of the customer’s workflow to post the company message. Customer engagement as Curtis Bingham and the chief customer officers of his council define it, it’s the willingness of the customer to devote discretionary time to the company for mutual benefit. What is the number of activities the customer participates in? To learn more about the collective crystal ball of the chief customer officer council–and other secrets about the CCO role, tune in to this podcast.